I’m dreaming again…this time of Brazil and Columbia. Anyone else having the same dream? Fabulous weekend…Indian summer. Yesterday, I made it to a dance class that I used to go to last year. It was great to be jazzing and jiggying with it so early in the morning. Ran errands after that and then Kahila and I wandered through place de molard and lunched in old town, as we watched the costumed Ninja Turtles, detectives and other brightly masked characters playing out whichever fairytale they were in. We strolled by the lake and found a little boat to carry us away. It was labouress! We were showered by the jet d’eau. It felt like being on the Maid of the Mist, though I’ve never done that. 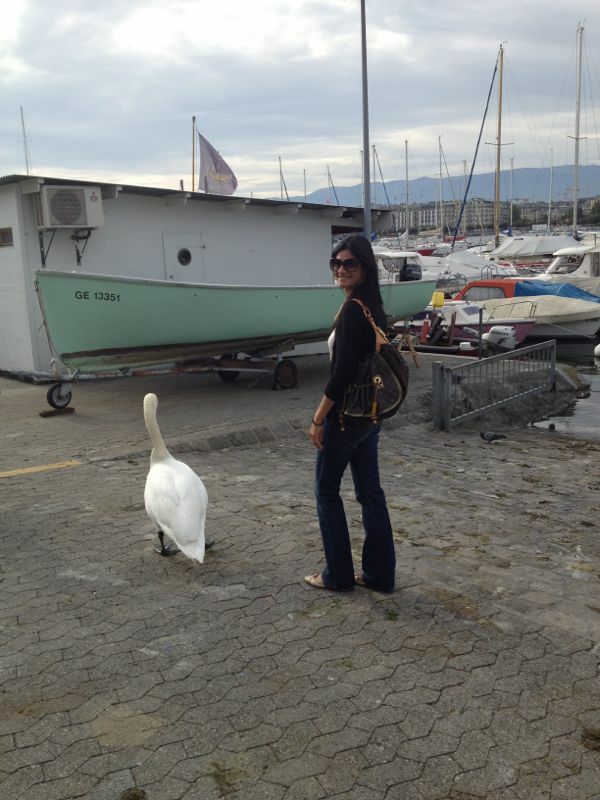 Finding a parking spot for our boat was a challenge as the large swans felt they owned the place. Which probably should be the case. I walked along the water until I got to my place and rested for a couple of hours before getting ready to go to a housewarming in Chambessy. Friends from Kenya have moved here. I fail to understand how I can handle such complex transportation systems in places like Delhi or London with such ease. I have a ‘feel’ for it. But when it comes to simple, more direct ways of traveling, such as in Geneva, I find it virtually impossible to get to my destination without misplacing myself. What should have taken me 15 minutes, took 1 hour and 45 minutes, by the time I got off the wrong train, caught a tram back to the main station, found the right train and then walked to the complex. All that exercise…I deserved a few drinks, double helpings of food and a plateful of brownies and apple crumble. Okay, so maybe I over did it. People from here and there were at the party. I had met Estelle once before. Interesting one. She works in the area of climate change and corruption. Her husband I believe, works for an oil company. Contradiction. He was not there. The two of them have managed to be in the type of marriage that many in my field choose…married but living apart. It has been 10 years for them. At least he will be leaving the States soon and moving to the Netherlands in the new year. But I wonder how they will merge when they both end up living under the same roof some day. Estelle, like me, seems to put her trust in other people’s hands while traveling to foreign countries. We shared our experiences of getting into strangers cars, having coffee with ‘dangerous’ folk, meeting some of the most interesting people because of these experiences, and feeling as though someone must be watching over us. I know that I must come across people who are not so ‘pure’ at times, I just cannot see it so easily. For example, a few weekends ago, Kahila and I went out in Geneva and met an interesting group. Well, they seemed ordinary to me, but she picked up on some vibe and sensed that we were not the ‘best’ to be hanging out with. She was also able to pin point to a certain degree why she felt they were who she thought they were. Without getting into so many details, I would never have figured it out. It was only when one of them said to me at some point in the night…’sometimes you will meet good people, and sometimes not so good, you should be careful’, did I realize she was right and that he was warning me himself about the people that he was amongst. I think her intuition is strong and though she is super friendly and outgoing, she can still spot the shades of grey. Well, at least Estelle and I have found one another. Tomorrow, we are going to go to the dance class together. It will be her first time. I hope her eyelashes do not fall off. Yesterday night, I came home to the smells of the bakery. Yes, I still live above the tantalizing bakery where I am succumbed to the smells of bread and croissants by midnight. Often, I cannot resist. Yesterday though, there was no room in the belly. Today, it is time to prepare for my next adventure. Kenya, I am coming. Mombasa, I shall be home soon.